Samsung has insisted that the spokesman who suggested that the company had done badly on tablets was actually trying to point out how confident the Korean giant was. In an interview with CNET(covered on TechRadar), Hakil Yoon was quoted as saying "honestly, we're not doing very well on tablets." However, Samsung's UK office has contacted us with what he actually meant to say, which was: "Seeking to kill your own product by releasing increasingly compelling devices might position Samsung as a confident brand." "A brand ambitious to improve its products so that the choice for consumers is between several Samsung products rather than between Samsung and its competitors' products," the statement continued. CNET's quotes picked up coverage across the globe, but Samsung appears keen to pull the messaging back into line from what appears to have been an errant comment. 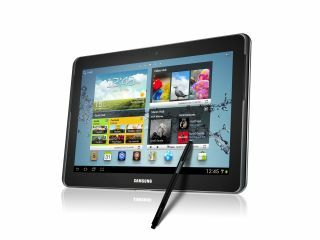 What is indisputable is that the Samsung Galaxy Note 10.1 has earned a lot of interest from the journalists at MWC 2012, with its pre-loaded Photoshop Touch and the S-Pen stylus.